Yesterday was another hot day in Holland, so when the kids got home from school, I offered them some money to go buy ice cream. I imagine most kids would have been pleasantly surprised, and say thanks. Not my 6yo. He asked if he could buy M&M’s instead. Visions of melted chocolate all over clean children’s shirts popped up, so I said “no, better not – chocolate melts in this weather – better buy that some other time”. I always thought that anything struck by lightning would be black and burnt. Yesterday, I discovered that it doesn’t have to be. This tree was struck during last Friday night’s thunderstorm, and all that happened was a strip of bark coming off from where the tree was hit, all the way down to the ground. 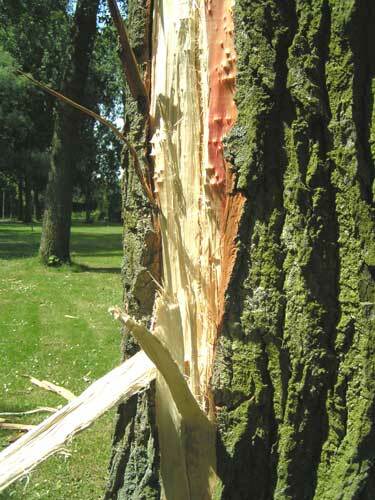 Here you can see the path the lightning took on its way to the ground. This is where the lightning first hit the tree — maybe it’s my imagination, but I think I see a very slight blackening on the white wood. 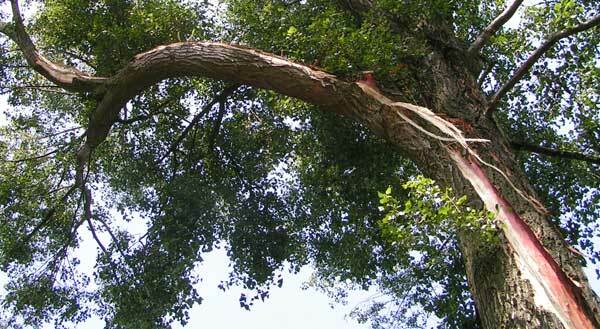 A close-up of the damage, taken near the bottom of the tree. Yesterday night I finally changed the last DNS record for LocusMeus.com. I had been developing this new version for at least two weeks now on another server, using the ‘www’ subdomain for testing, redirecting everybody else to the old version. The initial reason for the change, was that some pages were highly out of date, and some rearranging of pages was necessary. While I was busy figuring out how and what, I thought I could add a blog as well, and well, while I was at it, why not change the look and make it all completely new. Some pages were replaced by others (web design and hobbies for instance), and I added a couple of pages to the travel section. You can now read how much fun (not!) it was to walk around the Old City of Jerusalem without a proper map. The HTML and CSS section will be renovated, as I’m planning to gather some of the examples that used to be in the ‘temp’ directory, and give them a proper place on my site. For two years in a row I’ve been wanting to go camping with the kids, but somehow I never booked any place early enough, and by the time summer holiday started, obviously all camping sites were fully booked, or ridiculously expensive. This year however, my sister pointed me to a chain of camping sites of a different flavour: ‘nature campings’. These sites aren’t meant for the regular audience — there are no discos, no bingo nights, no swimming pools… they’re meant for people who want to enjoy the peace and quiet of nature itself. If only I’d known they existed earlier! Anyway, I do know of them now, and decided that this coming summer holiday I’d go check it out. Most of these camping sites don’t even need booking in advance, so that’s a bonus too. So, what’s the first and foremost necessity when camping in a country like Holland? Yep, that’s right, a tent. Tents can be rather expensive if you don’t want to settle for the average mini-iglo without any room for your stuff, so I’ve been looking around and comparing sizes and prices. 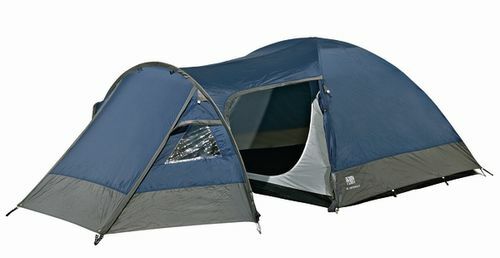 Then, the other day I saw an ad on TV, for a tent exactly like I wanted, for only €49.-. Not wanting to miss that chance, I went to the shop yesterday and bought it straight away. That, plus isolation mats and a gas cooker with refills. You are currently browsing the locusmeus blog archives for June, 2005.